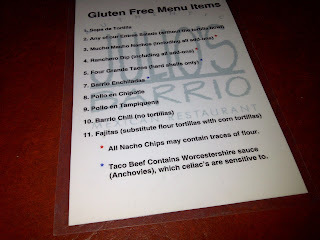 Gluten free menu at Julio Barrios on Whyte Ave.
We learned that Julios on Whyte Ave has a gluten free menu. This made sense to us, because typically corn flour is used in preparation of Mexican foods. Since we're party poopers and didn't want the party crowd on Saturday night, we went on a Sunday afternoon so we could ask questions without being rushed. Anyways, it's a fairly small gluten free menu with only 11 items on it. Unfortunately they indicate that their Taco Beef contains Worcestershire sauce, which sometimes contains wheat. It depends on which brand is being used, but I didn't ask which one they use and instead we just opted to not eat taco beef. When we cook we use Heinz brand Worcestershire sauce because they do not put wheat in their formula. So looking over the menu, if the beef is not able to be eaten, there is chicken or pork but overall it basically turns into a gluten free appetizer menu, unless you are vegetarian. Which isn't too bad, because Julios is a night time hang out, and you can certainly show up with some friends and have a plate of their famous macho nachos. Note that the hard taco shells are gluten free, but they did make a special batch of corn flour tortilla's for us as well. 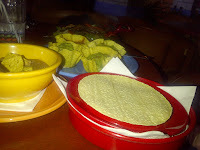 We were told that sometimes the kitchen has the corn flour tortillas and other times they do not. If that's your preference, it's worth asking if they've got any in the kitchen.